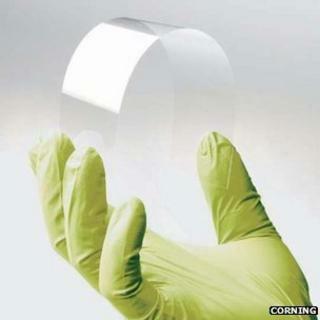 Dubbed Willow Glass, the product can be "wrapped" around a device, said the New York-based developer Corning. The glass was showcased at the Society for Information Display's Display Week, an industry trade show in Boston. Besides smartphones, it could also be used for displays that are not flat, the company said. But until such "conformable" screens appear on the market, the glass could be used for mobile devices that are constantly becoming slimmer. "Displays become more pervasive each day and manufacturers strive to make both portable devices and larger displays thinner," said Dipak Chowdhury, Willow Glass programme director at Corning. The prototype demonstrated in Boston was as thin as a sheet of paper, and the company said that it can be made to be just 0.05mm thick - thinner than the current 0.2mm or 0.5mm displays. The material used to make Willow Glass is the result of the firm's glassmaking process called Fusion. The technique involves melting the ingredients at 500C, and then producing a continuous sheet that can be rolled out in a mechanism similar to a traditional printing press. This roll-to-roll method is much easier and faster for mass production than the sheet-to-sheet process normally used to make super-thin glass, the firm said. In future, Willow Glass may replace the already widely-used Gorilla Glass, found on many smartphones and tablets. At this year's CES trade show in Las Vegas, Corning unveiled Gorilla Glass 2, said to be 20% thinner than the original product but with the same strength. The first-generation of Gorilla Glass, launched in 2007, has so far been used on more than 575 products by 33 manufacturers - covering more than half a billion devices worldwide. It was first spotted by the Apple founder Steve Jobs, who contacted Corning when the firm was developing the screen for its first iPhone in 2006. Willow Glass is not the first attempt to produce a futuristic flexible display. During the past few years, scientists around the world have been working with a material called graphene, first produced in 2004 - a super-conductive form of carbon made from single-atom-thick sheets. In a past interview with the BBC, a researcher from Cambridge University, Prof Andrea Ferrari, said that prototypes of flexible touchscreens made out of graphene have already been developed - and that besides being ultra strong and flexible, in future such displays could even give the user "sensational" feedback. "We went from physical buttons to touch screens, the next step will be integrating some sensing capabilities," said Prof Ferrari. "Your phone will be able to sense if you're touching it, will sense the environment around - you won't have to press a button to turn it on or off, it will recognise if you're using it or not." In a separate project, scientists from the Human Media Lab at Queen's University, Canada, and Arizona State University's Motivational Environments Research group, created a millimetres-thick prototype flexible smartphone in 2011, made of a so-called electronic paper. The scientists said they used the same e-ink technology as found in Amazon's Kindle e-book reader, bonded to flex sensors and a touchscreen that interpreted drawings and text written on it. "This computer looks, feels and operates like a small sheet of interactive paper," said one of the researchers, Dr Roel Vertegaal. "You interact with it by bending it into a cell phone, flipping the corner to turn pages, or writing on it with a pen."